F1-Demons - FIA proposes new regulations for F1. New FIA regulations : Time to rejoice? 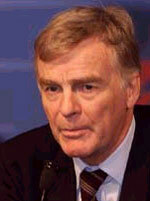 Begining 2003 the Formula1 races are sure to get rattled up as FIA chief Max Mosley's regulations to reign in F1 has been accepted almost unamimously. The only two teams who are opposed to the changes are the Mc Larens and Williams team. They believe that the new changes go against the "spirit" of Formula1 racing - which, until now has been about unbridles pursuit of automotive excellence. It has been reported that the two teams hope to take the matter to arbitration. However top teams such as Ferrari has agreed to the 'Heathrow Agreement' that brings about several key changes to the sport. The changes relate to qualifying, driver aid, testing and restrictions on mechanics. The changes have been propelled to trim escallating costs of formula1 racing as many low rung teams are getting left behind and are facing emminent bankrupcy as sponsorship money is drying out. Teams such as Jaguar have reason to rejoice as they desperately need the expense cuts to survive in the current F1 season. As a begining, drivers will be allowed only one 'hot lap' for qualifying for the pole. Get it wrong and you could be out. Last season they had a total of 12 laps and a window of 1 hour for their pole. Also expect radio communications with the pit to be limited and open to access of the FIA regulators and TV broadcasters. From the British Grand Prix on 20/07/2003 traction control, lauch control, and automotive gear boxes are also banned. There are also severe restrictions on tean mechanics and they will be unable to make any major changes to the cars between qualifying and raceday. Most importantly thought the point system has been revamped. Instead of the first six now the first eight drivers will be awarded points by the FIA. However with all this it remains to be seen how the championship piles on and how the races progress. With new tougher restrictions FIA is heading for a shake-up. Hopefully, with positive thoughts in mind, things will be smooth once the teams get their best brains together again. And once again F1 racing would become unpredictable. Hopefully, that is.